At Last... A Mind Reading App! While this app. may appear frivolous at first glance, it has some quite profound implications for the future. Using XWave enables you to control on-screen objects with your mind. It trains the brain to monitor and ultimately control the depth of relaxation (derived from Alpha Waves) and your attention span (derived from Beta Waves). The device's sensor reads the user's brainwaves (through the skull), converts them into digital signals and then displays them in various colours on the screen of the iPhone. 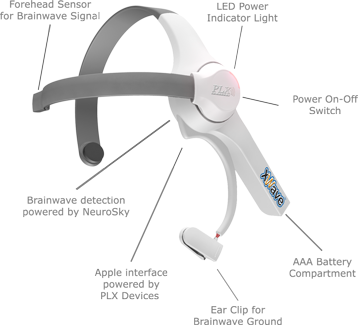 "XWave, powered by NeuroSky eSense patented technologies, senses the faintest electrical impulses transmitted through your skull to the surface of your forehead and converts these analog signals into digital. With XWave, you will be able to detect attention and meditation levels, as well as train your mind to control things. Objects in a game can be controlled, lights in your living room can change color depending on your mood; the possibilities are limited to only the power of your imagination." So it would seem that the evolution of mankind has taken yet another step - connecting your mind to your phone. All this for $US99.99, battery not included! According to a Twitter blog four seconds after midnight on January 1st, Japan Twitterers set an all-time record in the number of Tweets sent per second (TPS). At that moment a whopping 6,939 TPS were sent to friends and followers wishing them “Akemashite omedetou gozaimasu” (“Happy New Year!”). This frenzy of New year bonhomie more than doubled the previous record of 3,283 TPS, set during Japan’s victory over Denmark in the 2010 World Cup. "On New Year's Eve, we saw epic Tweet activity around the world as people in each time zone inaugurated 2011. The East coast time zone alone almost amassed the same amount of Tweets at its peak of 3,000 TPS as the entire world did during the peak moment of the World Cup." Not to be left out, Facebook has announced that its users had uploaded 750 million photos over the holiday weekend; although the irony is that they chose to announce this record effort... on Twitter. Facebook is not so popular in Japan and according to the New York Times, Facebook users in Japan number fewer than two million, or less than 2 percent of the country’s online population. That is in sharp contrast to the United States, where 60 percent of Internet users are on Facebook, according to the analytics site. 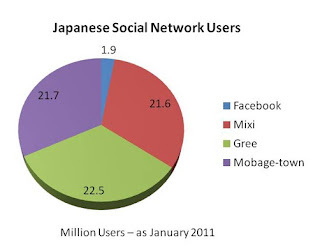 Mixi, Gree and Mobage-town are the local favourites and each has more than 20 million users. Part of the reason for the aversion to using Facebook is that the Japanese jealously guard their personal privacy, preferring to use pseudonyms or nicknames. Facebook does not allow for this masking of identities. Is There Still A Place For Email In 2011? As this presentation shows, email is predicted to grow from 2.9 billion accounts to 3.8 billion by 2014. So although social networks are clearly the fastest growing communication technology, email remains a potent weapon in the digital marketing arsenal. Business receive twice as much email as they send in a day and spam remains a constant problem. The rule of thumb is to try and send out 70% of useful or fun information and 30% which could be termed hard-sell. All email 'blasts' should integrate social media tools such as Facebook 'Like' buttons, tweet, or Stumbleupon options to push content beyond the original recipient. Email should have click through options to build engagement and do send a welcome message or series of messages to engage new email subscribers. It is surprising how few businesses (1%) do this at present. A prime motivation for people to give their email address to a company is to receive discounts and promotions. More than half expect to get a "freebie" in exchange for their address. Old habits die hard and 58% of consumers still start their day by reading their email. So time your email releases to hit them fresh each morning, before the drudgery of the day dilutes the effectiveness of the message.